We had the opportunity to facilitate a review for a subscription box from Green Kid Crafts . We received samples in exchange for a honest and unbiased review. We get excited about crafting! In fact in the next few months, we have some awesome ideas for some craft and D.I.Y projects to add to our blog. I love crafting with my kids. I'll gather up certain craft projects, and invite my nieces and nephews over for a night of crafting and munchies. It gives all the cousins time together and I love watching their creativity. Is there anything more precious than hand crafts made by your children? I have some that I will treasure forever. The kids were so excited to know they had a craft box coming. The most convenient thing about this box is I didn't need to gather any materials for these crafts. Each box comes complete with everything you and your child will need for the craft. I was appreciative of how easy they make it. Every Green Kid Craft subscription box comes with award winning, hands-on and eco-friendly kits. Your child will receive a unique and fun learning experience every month. They will enjoy 3-4 award winning creativity and STEM Science Kits that are connected with a new and exciting theme each month. The single Discovery Kits, which I think are a great gift idea for the coming Holidays are designed to support key developmental skills for kids. The boxes celebrate creativity and activates thinking and questioning while crafting fun projects. 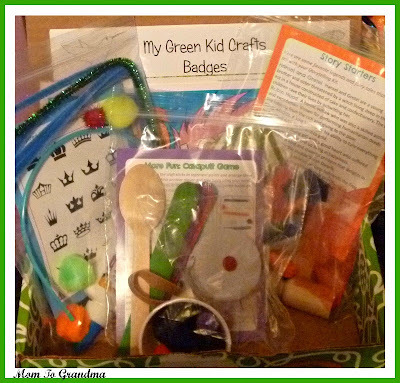 Green Kid Craft also offers single kits and party favors. Their perfect for keeping kids engaged with on the go learning and creativity. Green Kid Crafts is a green company that provides creative activities to do with your children. Every month your child would look forward to receiving a box with 3-4 fun nature themed projects. All materials provided are non toxic and sustainable. The box itself is recyclable. We received Discovery Box #32, Legends and Folktales. There was a story telling kit, The kids crafted little people for story telling. Another kit included the makings for a crown and a catapult. Also included was an activity book and a Green Kids badges poster, with each box there is a sticker. The kids can add their new badge to the poster after their craft is completed. Not only did my kids have a super great time crafting, I like that their learning new things as well. They learned that legends are semi true stories, that have been passed on from person to person. They have an important meaning or symbolism for the culture in which it originates. Some examples of legends are Atlantis, King Arthur and the Knights of the Round Table, Odysseus and Remus. They also learned Folktales are a traditional, fictional story that attempts to explain or provide some understanding of the world. A few examples of Folktale include Jack and Jill, Little Red Riding Hood and Johnny Appleseed. For monthly subscribers an exclusive online collection of additional reading lists, games and puzzles are offered free. Green Kid Crafts develop open-ended creativity and science kits that will exercise your children's creativity, build their confidence, and engage them with nature and the world around them.